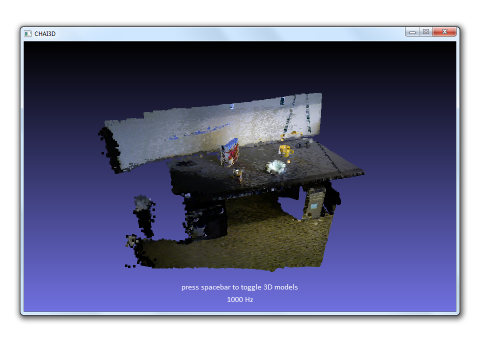 A point cloud is a set of data points in a three-dimensional coordinate system. In CHAI3D, these points are defined by X, Y, and Z coordinates, and often are intended to represent the external surface of an object. Similar to mesh objects, point cloud models use vertices to describe all the points that compose the cloud. A finger-proxy algorithm is also used to compute all the interaction forces between the haptic tool and the object. A collision detection must also be initialized after all points have been created.